Propeller is a term connected with a rotating object: motor or pump, and is used in this project. Propeller rotates a set of light-emitting diodes for displaying numbers, characters and symbols in a rotating manner that’s the reason why it is termed as a Propeller LED Display. Some of the features of Propeller LED Display include displaying messages in a typical manner; displaying numbers in analog and digital clocks, self cooling systems, and so on. Propeller runs on a single battery with wall adapter facility. The rotating LED displays can be cylindrical or disc shaped. The cylindrical displays are capable of displaying texts and digits, and the disc-shaped displays are capable of displaying analog clock. A Propeller display is a mechanically-scanned device that displays its characters in a digital format. 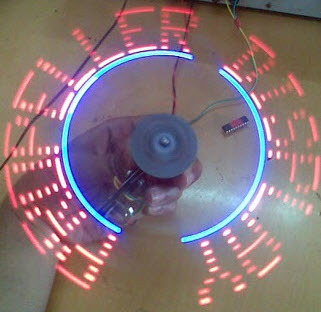 A propeller clock is a linear array of light emitting diodes rotating at a high angular velocity to generate a circular screen. The implementation of these display systems increases the curiosity of the learners because the concept involved in this project is exciting. Before proceeding further with this propeller concept, let us have a look at the normal display system to have a better understanding of it, and to differentiate it from others. This project is designed to display messages in a scrolling format on an alphanumeric-LED display. This type of LED display board circuit is available in public places like railway platforms, transport vehicles, banks, schools, hospitals, industries, etc., to display information. 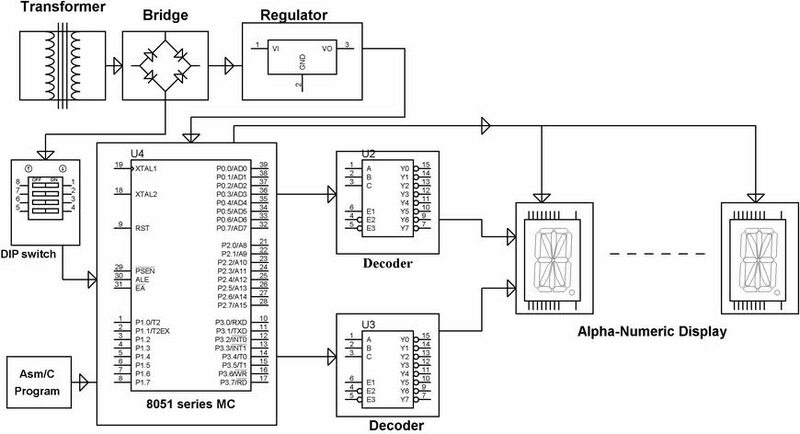 This project uses two decoders for turning each segment of seven-segment display. As we are using 16-characters display, for better utilization of microcontroller pins, these decoders play a key role. 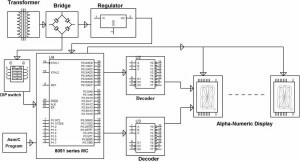 This 3 to 8 demultiplexer or decoder uses three pins from the microcontroller, and based on its high and low values, the output of the decoder varies. The system uses a power supply of 5V DC drawn from a voltage regulator, which is fed to the microcontroller and to the remaining of the circuit. 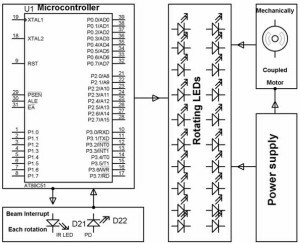 In this system, the microcontroller is programmed in such a way that the characters move in horizontal manner, and 16 different messages for display for different occasions are programmed in the microcontroller. These messages meant for different occasions can be selected by the user through a slide switch. Based on the program, the microcontroller sends the signals to the bits of the seven-segment display, such as a, b, c, d, e, and so on to ensure that a particular message will be displayed on it. The Power to this display is varied by a decoder output so that the message will be of scrolling nature. We hope that this concept is cleared to you; furthermore, this display can be extended by using a Propeller LED Display, which displays the information in moving fashion. This project is designed to display a message by using virtual LEDs. In this project, we are using a set of 20 LEDs instead of 525 LEDs because these are connected in multiplexing mode. This working of LED Display involves three circuits, viz. 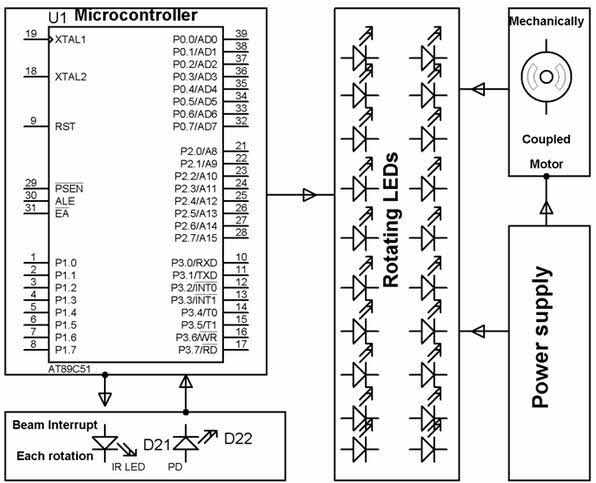 motor driver circuit, wireless power-transfer circuit and propeller-display circuits. In a motor-driver circuit, the power from the AC mains is stepped down to a motor-operating range by a step down transformer. Because it is a DC motor, the AC voltage is converted into DC using a bridge-rectifier circuit, and then it is regulated to a motor voltage. Supplying power to moving objects is not a simple task, therefore, in this project, a wireless -power transmission is to used supply the power to the control circuit, which is a moving object. For transferring the power wirelessly to some distance, the supply frequency must be increased to a certain extent. This process involves rectification, inversion and frequency changing with the use of a bridge rectifier, inverter and high-frequency transformer, respectively. This power is wirelessly transferred to the propeller display circuit. The wireless AC voltage received from the secondary coil is rectified into a DC voltage using a bridge rectifier, and this rectified DC power supply is given to the microcontroller, which is programmed, and then the message will be displayed on the rotating object by using a set of LEDs in space multiplexing mode. By this way, the LEDs display the message with the help of a motor driver in a rotating fashion. These are the two display message systems for displaying messages in moving and rotating manners. After reading this article, we believe that, you will be able to differentiate between a rotating-led display and moving-message display system. For any other help regarding these projects’ implementation, you can contact us by commenting in the comment section below. send the working video of this project …..